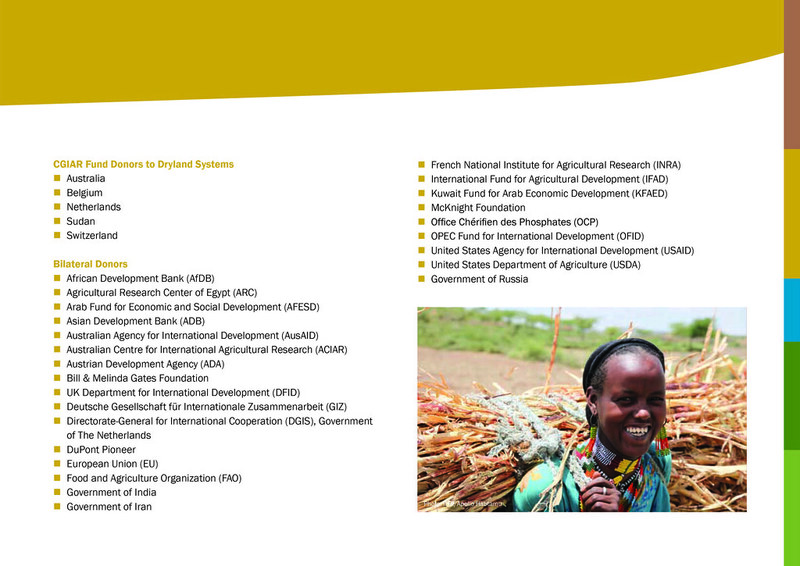 The CGIAR Research Program on Dryland Systems is carried out with support from CGIAR Fund Donors and through bilateral funding agreements. Rural dryland communities in developing countries face mounting development challenges relating to poverty, food security and nutrition, climate change, water scarcity, and land and resource degradation, as well as social and political unrest. Tackling these challenges requires significant resources and long-term financing for sophisticated programs. Thanks to the support and contributions from our valued CGIAR Fund Donors and 25 bilateral donors who share our commitment to eradicating poverty, hunger, and malnutrition, Dryland Systems is making progress with new initiatives and innovations for the benefit of smallholder farmers in dry areas. We are extremely grateful to all our donors who make this work possible, as we strive to be efficient, collaborative, and impact-oriented so that together we can truly transform the lives of the impoverished rural dryland communities.